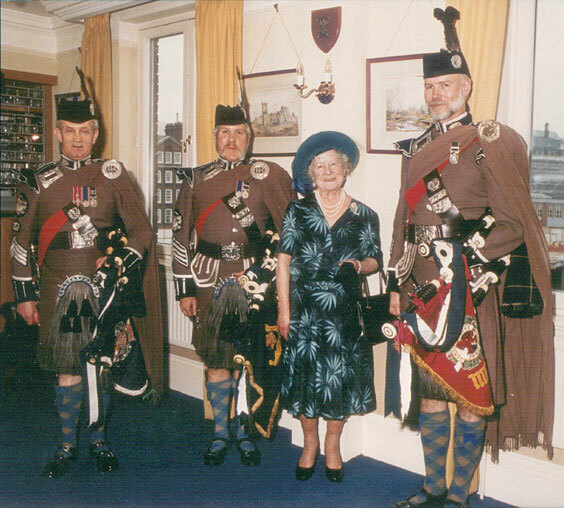 The following is a list of bagpipers to the Queen Mother of United Kingdom from when the position was established in 1953 through to 2002, the year of her death. If you have something to contribute, please let me know. PM John Spoore, RVM in the uniform of The London Scottish, from whom all Personal Pipers to the Queen Mother were chosen. This 1989 photograph provided and used by permission of PM John Spoore. PM Christopher MacPherson in full ceremonial dress. This photo was taken August 4, 2000, on Her Majesty, The Queen Mother's Centenary Birthday, in the gardens of her London Residence, Clarence House. Note the banner shows Her Majesty's Cypher, the opposite side of the same banner carried by PM John Spoore in the above photo. This photograph provided and used by permission of PM Christopher MacPherson. *Military service prior to Territorial Army (Reserves) in which all Personal Pipers served. The Pipe Majors de Laspee, Duncan, Spoore and King were each awarded the R.V.M. (The Silver Medal of The Royal Victorian Order). The above photo (circa 1992) was taken at the London Scottish headquarters. Left to Right: PM David Duncan MBE RVM, PM John Spoore RVM, HM Queen Elizabeth, Queen Mother (at 92 years), and PM Ian King. (Ian was later awarded the RVM). 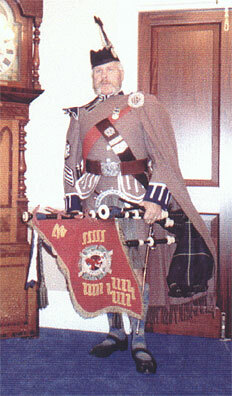 Ian is wearing Her Majesty's pipe banner, indicating that he is the appointed Personal Piper. Both David Duncan and John Spoore had officially retired from the London Scottish, but retained their uniforms to guest with the London Scottish P&D from time to time. John Spoore played much more often with the band than David since John was appointed Honorary Pipe President, an unpaid position as a player-manager, from 1990-1999. Reproduced by kind permission of the Regimental Colonel and the Trustees of The London Scottish Regimental Trust. Whereas the pipers appointed to H.M. Queen Elizabeth II were serving regular Army pipe majors, the pipers appointed to H.M. Queen Elizabeth Queen Mother were all from The Territorial Army (Reserve Forces). It was in 1935 that H.R.H. The Princess Elizabeth, Duchess of York, graciously accepted the Honorary Colonelcy of The London Scottish Regiment. Upon the abdication of Edward VIII and the Coronation of H.M. King George VI, the then Queen Elizabeth, requested to remain as Honorary Colonel. It was following the death of King George VI and the Coronation of H.M. Queen Elizabeth II that the now "Queen Elizabeth - The Queen Mother" requested from her regiment that a piper be appointed as "Personal Piper to H.M. Queen Elizabeth, Queen Mother." Thus in 1953, the honorary appointment was established. Note: The QM was also Honorary Colonel of The Black Watch, but her colonelcy of the L.S. was earlier. PM Leslie V.N. de Laspee in this undated photo taken in the late 1950s or very early 1960s. An interesting tidbit from John Spoore, "'de' was always very slim—a good athlete in his younger days—but by being slim and this photo being shot from a low camera angle, it makes him look very tall, but he was about my height of 5ft, 8ins." 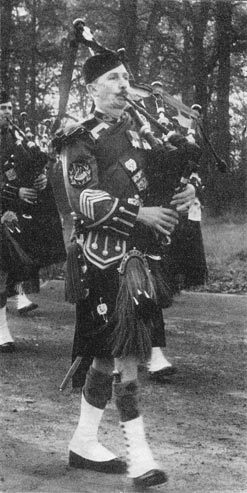 All the QM Personal Pipers—except one—were the current pipe major of The London Scottish Pipes & Drums at the time of their appointment. 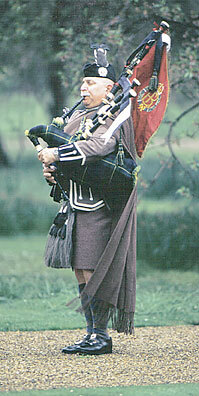 Leslie de Laspie was the pipe sergeant at the time of his appointment, but very soon after, was appointed pipe major. 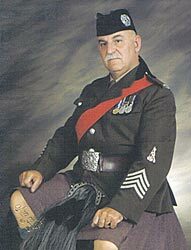 While the LSP&D now has some civilian members, the pipe major has—to date—always been a serving reservist. Selection of the Personal Piper, was almost "hereditary," as one took up the pipe majorship of the L.S., but an interview and a recommendation to H.M. was the deciding factor. There was no additional financial compensation as Personal Piper to the Queen Mother. As PM Spoore explains, "The appointment was indeed an honour, financial reward would not have been relevant." PM Christopher MacPherson in the No. 2 dress uniform.The chevrons and piper's badge are worn on both sleeves.The red sash is worn by all sergeants up to warrant officer. On the epaulets is the wording "London Scottish" in silver. The duties included the attendance of "Her Piper" on three mornings of each week, to play in the gardens of her residence—Clarence House—beneath her window. Her piper would also play as and when requested (sometimes with the Queen's Piper) at St. James's and Buckingham Palaces and other royal residences. He would occasionally also accompany her on official visits to galleries, theaters etc. and for various functions such as: balls, banquets, royal visits, investitures, premiers, private parties and the like. The duties somewhat lessened over the years with the aging of The Queen Mother. To quote PM Christopher MacPherson, "My duties were to play in the gardens of Clarence House on the second Wednesday of each month when Her Majesty was in residence from 9 a.m. to 9:15 a.m."
The Passing of the Queen Mother. A massed band of just under 200 pipers and drummers, marched the gun carriage bearing the Queen Mother's coffin from Westminster Palace where she had laid in state, to Westminster Abbey playing the tunes "My Home" and "The Mist Covered Mountains" (played in funeral march time). "Of't In The Stilly Night" was the lament played at The Abbey. PM John Spoore said, "It was a very sad but proud day." PM Christopher MacPherson informed me, "As I was still serving when Her Majesty sadly passed away, I was recalled by Her Majesty The Queen to play the lament, Flowers of the Forest, in tribute to Her Majesty Queen Elizabeth The Queen Mother at The Royal Caledonian Ball as Her Majesty The Queen is The Patron. This event took place on 29th April 2002 twenty-four days after Her Majesty's State Funeral. I am proud to have been Her Majesty's last Personal Piper to have played for Her and to have carried her banner." Thank you to Pipe Major John F. J. Spoore, RVM who was kind enough to provide me practically all the details for this page and put up with my flow of questions. Also to PM Christopher MacPherson and PM John Bracken for their very helpful contributions. This page last updated Monday, March 19, 2012. Page first created in December 15, 2004.